It is that time again! The PlayStation Classics is here to help remind you about worthwhile PSOne Classics and PS2 Classics you might have missed over the years. Do you know what is coming out this week? It is God Wars: The Complete Legend! That is a turn-based strategic-RPG inspired by mythology and folk tales. You know what is also a turn-based strategic-RPG that deals with folk tales and mythology? The PSOne Classic Saiyuki: Journey West! As anyone who has watched the Saiyuki anime series might guess, Saiyuki: Journey West is a retelling of Journey to the West. (The two series are unrelated, though.) Koei put together this strategic-RPG to give people a chance to see Sanzo’s story in a new light. After deciding on a gender for Sanzo, who can be male or female, the game begins with a battle where Sanzo discovers and unseals Son Goku, the first member of the party. 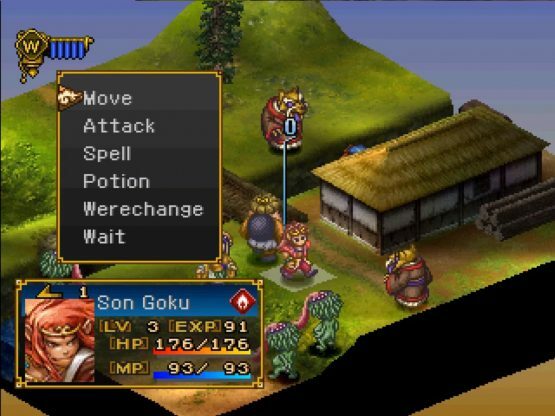 For the most part, Saiyuki: Journey West is a typical strategic-RPG. You select units to head into a battle. Everyone moves on a grid, with different elevations and directions to take into account. You take turns to move characters and attack enemies. There are opportunities to strengthen characters, by visiting dojos. There are certain spells, skills, and pieces of equipment you get by taking the time to do absolutely everything. What sets Saiyuki: Journey West apart from most PlayStation games at the time, aside from the fact you could choose your avatar’s gender, was the Wereform system. Except for Sanzo, every party member has a transformation that turns them from a human being into some sort of monster form. Using Goku as an example, he turns into a giant monkey. This allows these extra characters to learn and use special attacks that fit their respective characters’ backstories and elements. Don’t worry about that meaning Sanzo might be underpowered. While this avatar does not have a Wereform that allows the character to transform, become more powerful, and have access to attacks that are quite effective, this person can use guardians. You know how the Final Fantasy series has summons that bring spirits into battle to do damage or provide aid? Sanzo’s guardians function similarly. What is also nice about Saiyuki: Journey West is that it lends some weight to decisions you might make. As Sanzo heads out on the journey, five people will automatically join the party. These folks are Goku, Hakkai, Ryorin, Gojo, and Kikka. However, making certain choices as you play can lead to other people joining the party. For example, Reikan joined my party when I told Ryorin I did not think he was annoying. Ginrei and Kinrei become playable after events during the second chapter. After beating both of the twins at Plateau Mountain and Lotus Cave, I found both were willing to join my party after reaching the city of Kucha. Does hearing about Saiyuki: Journey West make you want to give it a try? Well, you can right now. It is available as a PSOne Classic classic in the North American PlayStation Store. It costs $5.99 and is playable on the PlayStation 3, PlayStation Portable, and PlayStation Vita.